2016 Mercedes-Benz C-Class C 220 d Coupe review | What Car? Although the latest generation of Mercedes’ C-Class has been around since 2014, we’ve been made to wait a little longer for the two-door coupe version; nearly two years in fact. When compared with its predecessor, this new model is significantly longer and a fair bit wider to help make both front and rear seat occupants more comfortable. Even with the increase in size, there’s still room for only four passengers, just like in a BMW 4 Series or Audi A5. The Coupe may share a platform with the saloon and estate, but Mercedes has worked hard to differentiate it from its more humdrum siblings. Only the bonnet and front wings are shared, the rest of the car looking very reminiscent of the larger and more expensive S-Class Coupe. While the looks are subjective, there’s no arguing with the increased efficiency of the latest C-Class Coupe; up to 27% less fuel is consumed when compared with the old model. The entry-level diesel is now good for a claimed 68.9mpg on the combined cycle with emissions of 106g/km. What is the 2016 Mercedes-Benz C 220 d Coupe like to drive? In short, the breadth of the C-Class Coupe’s abilities impressed us greatly, although it's worth noting our test car was fitted with optional air suspension with three switchable modes; Comfort, Sport and Sport +. In the softest of the three settings, bumps were absorbed with a pillowy softness that allowed for comfortable cruising over a wide variety of road surfaces. Only particular sharp ridges caused the suspension issues, with everything else smoothed over admirably. It really does feel like a larger luxury car. Unfortunately, that also means there is a little bit of float and wallow, but never enough for it to become uncomfortable or disconcerting. Present, too, is a fair amount of body roll, but that said, there’s always the other two stiffer suspension settings if you want to corner quickly. Sport firms up the suspension noticeably, reducing roll and preventing any unwanted movement from the body after a bump. You do notice bumps a lot more, but it’s never uncomfortable and may be preferable for those who prefer to feel more of the road passing beneath them. Moving up to Sport+ ramps things up even further, to the point that, on the kind of broken Tarmac we see so often in Britain, it is a little too stiff. To Mercedes’ credit, it never crashes over bumps, but the suspension never fully settles either. On smooth roads it would be fine, it’s just a shame they're in such short supply. The steering is also variable, the faster you go the slower it reacts. This means that you only need one turn of the wheel to apply full lock at parking speeds, while at higher speeds you need to turn the wheel a lot more for the same amount of steering angle. While this could feel unnatural, it’s a system that is very easy to get used to. The downside is that there’s almost no feedback for those who like to know what the front tyres are doing. It also gets unnecessarily heavy and arguably too quick in sports mode. As for the engine, it’s a familiar story for those who have experience of Mercedes powerplants. The 2.1-litre diesel feels muscular enough with 168bhp, but it sounds coarse when pushed hard. The good news is that a new nine-speed gearbox means engine revs are usually kept low, while shifts are smooth and swift. What is the 2016 Mercedes-Benz C 220 d Coupe like inside? The dashboard has been lifted straight out of the C-Class saloon - no bad thing at all. Everything feels of high quality with all the major controls sensibly laid out. The metal-effect trims help lift the cabin ambience well, as does the optional leather effect dash top. Our car's black wood may not be to everyone’s taste, but there are plenty of other options available. What may be harder to accept for some is the infotainment screen that’s perched on top of the dashboard, appearing a little like an afterthought. It’s right in your line of sight, though, and much better than an integrated system mounted halfway down the centre console. The infotainment system control does take a little getting used because the menus are quite complex. Overall, it’s not quite as intuitive as BMW’s iDrive system. Should it all get too much, though, there is also voice control for certain functions. Gaining access to the rear seats isn’t as tricky as it could be thanks to large doors and front seats that tilt and slide forward a good amount. Ultimately, two adults will fit in the back, but anybody approaching six-foot will have their head canted to one side. Legroom isn’t too much of an issue compared with some rivals, however. As for the boot, it’s decently wide and stretches a long way towards the front of the car. You’d have no trouble getting a couple of sets of golf clubs in there, and there’s also a ski flap for longer items. To make it even more practical, there’s a remote release and the option of powered closing too. There are plenty of reasons why you should. Interior quality is good, and there’s nothing else in this class that can get near the ride comfort on offer, something that – along with the low running costs – makes it a perfect long distance companion. Yes, this is based on buying a car with the optional air suspension, but £900 seems a perfectly reasonable amount of money for the adaptability it gives. Unfortunately, we've yet to try the standard set-up. Ultimately, we’ll need to put the C-Class Coupe up against its arch-rival, the BMW 4 Series, to definitively know which is better. 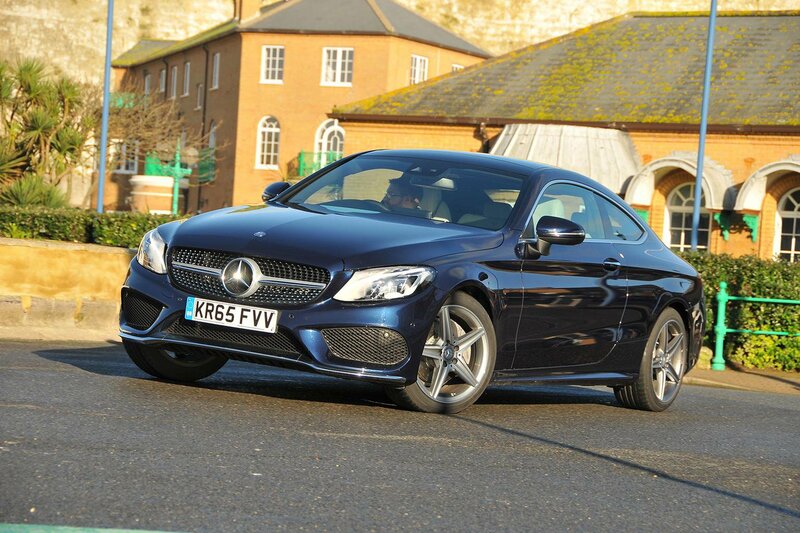 In the meantime, we’d certainly recommend putting the C-Class on your shortlist if you’re in the market for a coupe.